How to clone to DVD to a new DVD for backup? Fast clone movie DVD to a new DVD disc for backup.
" Yesterday, when I sorted out my movie DVD, an idea occurred to me, I wanted to clone DVD to a new one for backup in case of DVD missing or damages caused by scratches. The problem is that I don't know which an useful program can help me clone DVD to new DVDs? Waiting for your answer. -- a question from YAHOO ANSWERS. You should appreciate 3herosft DVD Cloner, it enables you to clone movie DVD to to new DVDs with high quality. For you, it's definitely a smart choice! How to cloner movie DVD to a new DVD disc for backup? 3herosoft DVD Cloner is so easy-to-handle DVD copy software to copy DVD movie perfectly at fast speed.Follow this guide step by step and learn how to clone DVD to another blank one for backup. Run 3herosoft DVD Cloner and insert a DVD-Video disc in your DVD-ROM. It will auto-detect all drives on your computer and show the information in the "Source" combo box and "Destination" combo box. Step2: Specify the "Source" and "Destination"
Specify source DVD drive in "Source" combo box and specify target drive in "Destinationt" combo box. Then it will pop up a message box reminding you to select target disc type. There are three options (D5, D9, Custom ) to select. Tip: You may have only one DVD ROM. Just select the same DVD Drive as the " Source" and "Destinationt ". In this step, 3herosoft DVD Cloner will copy the source DVD to your computer temporary file folder. When copying, it will display the copying progress in main interface. Step4: Copy to the "Destination"
After the source DVD is copied to temporary file folder in your hard disk, it will begin to copy the temporary file to your target. Note: Here, it will pop up a message box telling you "Please insert an empty disc to write to...". At the same time your DVD RW Drive will be ejected. Insert a blank DVD, then click " Retry" button. 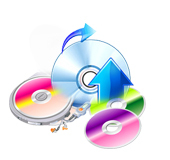 Once DVD to DVD copying completed, 3herosoft DVD Cloner will pop up a message box showing copy information including "Source", "Destination", "Copy mode", "Compress ratio" and "Time".